I was 51 years old when I met my wife. Being from Russia where male life expectancy was 57 years, she expressed the belief that we would likely have a short, but hopefully happy, life together. Displeased with her attitude I told her that I planned on living to 93. It now appears that my prognostication may have been pessimistic. At the outset, I will emphasize that while I enthusiastically support the research efforts in what is generally known as radical life extension, this article is not about that. Here, I am examining existing statistical trends in life expectancy. Recently, there have been several articles discussing life expectancy and income. What they found is that the upper quintile income 50 year old man has a life expectancy of 88.8 years. That was me at 50. 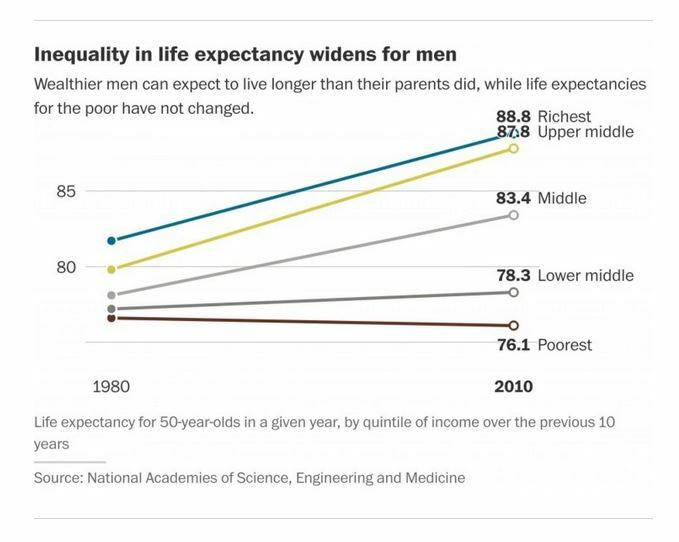 However, a more precise statement is that of those upper quintile men who were 50 in 1971, half of them were alive in 2010. The graph clearly shows the life expectancy of a 50 year old upper decile man has been consistently increasing at the rate of .225 years per year. Since I am 29 years younger than the cohort used for the analysis, one would have to adjust and render a life expectancy of 88.8+(29×.225) or 95.3 years. That was my "if trends continue" life expectancy when I was 50. However, every year you survive doesn't bring you a year closer to your actuarial death age because surviving that year increased you life expectancy. So, we can look at the actuarial tables and see how much surviving the last 18 years since I was 50 has gained for me. Using a life expectancy calculator, I find that it has added 3.0 years. So, a pure extrapolation of current trends suggests that my life expectacy is about 98.3 years. There are reasons why that may be too high and reasons that it may be too low. However, that just means that 98 is a well balanced estimate based on current trends. Of course, life extension breakthroughs over the next thirty years could increase life expectancies even more, which is the basis of the life expectancy escape velocity concept. A very valid question is whether the extra years will be productive years? Or will it just add 15 years of increasing frailty? I know that at 68 I am nowhere near ready to sit back in my rocking chair and just watch the days and weeks and months and years roll by. Certainly I can take encouragement from Andy Rooney who did his show up to six weeks of his death at 92. Milton Friedman died at 94 with a Wall Street Journal column "in the mail". So, based on history, it seems probable that those extra years can be productive. But, it doesn't end there. Based on Mayo Clinic research, United Biotechnology is beginning clinical trials on senolytics, which, while not demonstrated to increase lifespans in mouse models, appears to stimulate youthful phenotypes. In other words, while they won't make you live longer they will make you live younger. This is going to be a huge change for most people. For many people 'empty nest and working' is an idyllic time of life. Income is high, one is engaged in life and free from the encumbering responsibility of parenting. Sadly, it is also often one of the shortest phases of life, typically lasting no more than ten to fifteen years. Now, if like Andy Rooney and Milton Friedman, one works into one's 90s, this time of life may last for 35 years or more. I just told my wife about these new calculations. It may seem like a surprising conclusion, but why? Prince Phillip is 98 and he just retired. Queen Elizabeth II is 92 and still working. The last two POTUS to die were 93 and Bush I and Carter are 94. Over the next few years, as we get more examples like the ones I mention here, it will seem less fanciful. When articles discuss this, they routinely emphasize that, depending upon the study, the upper decile collects 15 to 20 years more social security than the lower decile. 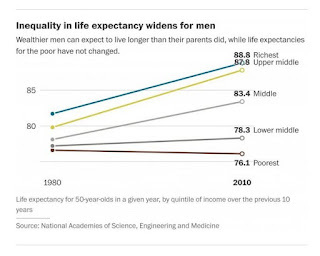 They imply, though they do not substantiate, that the gap in life expectancy is the result of the income disparity. Most of it, in all likelihood, is not. First, sickly people generally earn less and also die sooner. Second, lower income people tend to use various illicit drugs that are a contributory factor in both lower income and life expectancy. Third, it appears that the genes that contribute to higher IQ also contribute to longer lifespans. IQ and income are positively correlated. Lastly, the success traits that lead to higher income also lead to healthier lifestyles. Having said that, there is a tendency for lower income people, out of the fear of cost, to wait longer to seek medical services once symptoms appear. Still, the lowest decile in the U.S. generally qualify for Medicaid and/or Medicare. This would be more of a likely explanation for the second and third decile. My son just turned 30 and if you run these numbers on his age group, you get ridiculous results that, without radical life extension breakthroughs, won't happen. The reason is because these gains are the result of delaying the age related causes of death. Without new technologies that slow the aging process the life expectancy curve will be sigmoidal with, according to current research, an asymptote at just over 100. So, this 100 year life expectancy applies to nearly everyone. For me, I plan on spending the next five years or so working primarily on The Polymath Institute, this blog and a few books . Then I will shift my focus to building some expression of Suma Caye. That will take me to 83. After that I will put my efforts into investing in polymathic enterprises and writing additional books, if I have any more in me. Those are my plans, since I'm planning on thirty more years. How about you? Will the expectation of a 100 year lifespan change how you plan your life? Great blog. I have only just found it but will now be a regular reader. I am only 37 myself but I keep saying to my girlfriend that I think I can live to 120. Hopefully some medical breakthroughs can emerge in the next 50 years that can increase life expentancy that much. Where people are comfortable at that age. I don't want to just be alive in a chair but not doing anything. I want to be learning still right up until the last moment. Then you need to get connected with the nearly 5,000 members of Polymathica who agree with you. Subscribe to The Polymath.